Only 10 more days of 2011?!? Life has been awesome lately. Zero complaints from this girl. I'd have to say the highlight of my day is usually around 10:45am when I see my mailman. Been loving all the Christmas cards & random thoughtful gifts. Like this one from the one and only MissZippy. I FINALLY get to meet her in February and I'm freaking excited. 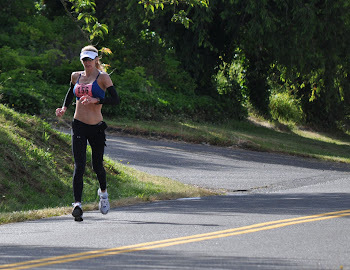 She was one of the very first running blogs I ever followed. She. Rocks. I got this from my Peanut. [thank you Pinterest] hilarious. I received this from Jess at "Run With Jess" .......so freaking creative. Was instantly feeling really bad for my Secret Santa when I got her gift. Coolest calendar ever! On the treadmill note . . .
What. did. you. ask. Santa. For? so you figured out the secret code, huh?! LOL! Very cool calendar! Peanut is the coolest. And so glad you like the tee! I asked for a new computer because mine died during "scheduled maintenance" (AKA hubby trying to do some bizarre upgrade that only computer geeks would find necessary). Wow! The mailman has been good to you. Very cool. Nice work on the 20 this morning. You rock! I asked Santa for a new house. Go big or go home right? P/S I don't think he is bringing it. How would it fit down the chimney? I hope you and yours have a wonderfully Merry Christmas!!!! Mama wants a big shiny PR! I asked! Merry Christmas!